Welcome to another post in our Top 5 Series! Walt Disney World is full of wonderful scents – some put out during rides on purpose, others not so intentional. No matter what though, scents from Walt Disney World are always a pleasant memory to me. When I get a “Disney scent” outside of “the world”, it always bring back wonderful memories. Here are my top 5 scents of Walt Disney World. 5. Spaceship Earth (Burning Rome): A great smell that is distinctly “Disney”. A classic that most can recognize – it had to make this list! 4. Soarin’ (Orange and Pine): Soarin’ is one of my favorite rides ever. And anytime I’m in the “real world” and get a whiff of orange or pine scented air freshner or spray, it instantly takes me to Soarin’. 3. Monorail (Air Conditioner): You know the smell. You are waiting in line for the monorail in the hot Florida heat. The monorail finally pulls up and you enter the wonderful ice-cold monorail car that has that air conditioner-ish smell. 2. Hotel Rooms (Clean scent): You’ve walked up stairs or taken the elevator with luggage. Hunt your room down, and when you find it, you walk in to that clean smelling (most of the time) room that welcomes you to relax and turn on the TV to watch Stacy. 1. Water Rides (Chlorine/Water smell): Any ride that has water: Living with the Land, it’s a small world, Pirates of the Caribbean and the like. Walking into the building that houses the ride, you get closer and closer to the actual attraction and the smell of chlorine in the water lets you know you are there. These are just a few of the wonderful scents of Walt Disney World. They play a big part in helping remember the magic! Are there more? Leave a comment and let us know what your favorite Disney scents are. Think I’m crazy? Leave a comment too! The first time I rode Soarin’ with my family and we “flew” over the orange groves I was yelling..”Do you smell that?! I can smell that!” Of course, nobody else caught it but me. The Soarin’ scents are great – it adds a whole new layer to the experience. The bathrooms….they have a clean lemonish smell… only at the Magic Kingdom. Very true. Not all bathrooms (I don’t think), but some of them, yes! This is FANTSASTIC…I thought I was the only one who like the chlorine/air conditioning smell! Whenever I pass a chlorinated waterfall or smell airconditioning somewhere, I say “That Smells Like DIsney”. LOL…and the ORANGES…love it! The first time I rode Soarin’ I was so happy because they used “the orange smell from Horizons”! Same here! Anytime I’m not in “the World” and smell one of these smells, it brings me right back to WDW. Love it. The smell of pop corn as you exit the tunnel under the railroad station into the Magic Kingdom does it for me. It is attached to so many 1sts-1st visit, 1st visit with children etc. If I want a “Disney moment” I just pop some corn-easy, quick, and economical. 5. Turkey Leg Smell…I definitly know I’m in Disney!!! I know we all have our own…just my 2, err I mean, 5 cents. How about “It’s a Small World” … Ok not really a smell, but on those really hot days, it’s a great place to cool down … if you can get THAT song out of your head. I agree! 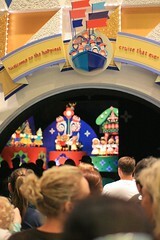 It’s a small world, carousel of progress and the like are awesome places to cool down. …I actually just found a scented oil that smells almost exactly like the ‘Burning Rome’ smell of Spaceship Earth that Us WDW fanatics know and love! …Not a problem! Everyone agrees that it smells exactly like it! I highly suggest checking it out! Speaking of Spaceship Earth, I remember the last time I was there, walking up the ramp into the entrance and saying to My girlfriend ‘Wow, it smells like the 80’s”…I’m not sure what it is about that queue, but there’s a very ’80’s’ type of smell there (I hadn’t been to Epcot until I moved to Florida in 2000, so it’s not a childhood association thing), and it’s not the kind of smell that You can easily explain, but there’s a crisp smell, almost like a new carpet -type scent that for some reason instantly brings memories of arcades from My childhood (I was born in 1979)…anyone else know what I’m talking about? Oh my! I was googling this and I am so happy to know I am not the only one! This is my favorite Disney World scents, since I am closer to that attraction- about 30 minutes away! 3. the hot dog smell of casey’s hot dogs. Those are all great scents, Jamie! So you live 30 minutes away from WDW? So lucky. I’m only about 2-2.5 hours away…it seems to be an eternity though! I am not sure it is the chlorine in the water but Disney water rides have a very unique scent. It is my husband’s favorite. I can almost hear him, “Smell the Disney? ?” like an excited 12 year old. The water IS the scent of Disney for us. Soarin’ – the orange groves, yes. But there’s also an ocean scent upon soarin’ oer’ the ocean and a grapes / wine scent as you soar over Napa Valley etc… Also – (a retro scent) – in the cue line AND in the defunct attraction, Horizons” at Epcot, there was an orange grove / citrus smell. THIS is the one I remember most because it was there when the attraction opened in the early 80’s. During Christmas time at Epcot in The American Pavilion, they set up the Ginger Bread House – and that smell of ginger (bread). And that reminds me – in the old Mickey’s Very Merry Christmas Parade, Chip & Dale are baking cookies and you can smell ginger as well. I could go on and on but it would further prove I need a life and need to stop hangin’ out at WDW so much ;-). NICE – thanks Lance, I joined. This was the inspiration of my blog post today. I linked back to you and posted the original link, then added my own list. :). Anytime I smell fresh asphalt it takes me back to walking up to and waiting to get on the trams… I love that smell! The first time I used one of those Srcubbing Bubble automatic shower cleaners, I was ecstatic, not because it was supposedly cleaning my shower, but because suddenly, my bathroom smelled like one of the Resort’s hotel bathrooms. There is some sort of very faint “air freshener” in the lobby of the Beach Club. I have nnever smelled anything like it. So, I asked. It is their “Beach Club” scent and I wasn’t imagining it. Apparently it is in their air ciculating system somehow. It is supposed to be reminiscent of a fresh smelling beach. Love it! – who doesn’t love the smell of fresh popcorn?! I love the smells on Disney rides, especially the burning rome smell and the indoor water rides smell. But my favorite ride smell is the spray mist on test track, I think it is used on other rides, but test track is where I distinctly remember it. Very strong chemical smell, but not unpleasant. Me and my family usually visit Disney one a year..we always have a great time there. A lot of fun, nice and happy people, nice shops for souvenirs (the kids always find something to buy :)), but nothing about this scents.. I mean beside the hotel specific smell that I found in each hotel that I stayed in..nothing new. 😦 I wonder..do I have a problem because I don’t associate Disney with all this scents? Maybe I’m to stressed. Maybe I have to go back in time and be a kid again..maybe I must be more relaxed and live the moment like my children do..and forget about all the problems. You may think this is wierd, but the humidity+floral combination scent when arriving in Disney on the first day of each trip. I have recognized this scent so many times that it is the first thing I think of when I ask myself “WDW?” I guess it got stuck in my head at the age of 1/2 a year old. Polynesian! The lobby! When someone in my family or friends go, I ask them to sniff inside the Polynesian for me! I agree with all of the above, but want to add the scent of the park and resort gift shops. It’s the distinctive smell of new plastic and fabric dye, but isn’t unpleasant. I can never pass a Disney Store at a mall without at least stopping in for a few minutes just to get a quick “Disney fix” as those stores have the same scent as the park and resort gift shops. I was also recently at a non-Disney hotel where the pleasant scent in the lobby reminded me of every Disney resort hotel I’ve ever been in. Hi there, simply turned into alert to your blog thru Google, and located that it is truly informative. I am gonna watch out for brussels. I will be grateful when you continue this in future. Numerous folks might be benefited out of your writing. Cheers! Great weblog here! Additionally your site so much up very fast! I’m really loving the theme/design of your weblog. Do you ever run into any web browser compatibility issues? A few of my blog visitors have complained about my site not working correctly in Explorer but looks great in Safari. Do you have any advice to help fix this issue? so I just wanted to give a quick shout out and say I genuinely enjoy reading through your blog posts. Hello to every one, because I am genuinely keen of reading this webpage’s post to be updated regularly. It carries good stuff. whoah this blog is great i like reading your articles. Stay up the great work! Are you currently thinking about cutting your expenses every week? Is grocery buying something which you feel requires a lot of of one’s money? The article will offer you with every thing you should know about carrabba coupons printable and how they are able to assist. ← Poll: Which Attraction is Worth the Longest Wait?